Two iconic works by Dan Flavin (American, b. New York, 1933–1996) from the collection are on view. “untitled (to Helga and Carlo, with respect and affection)” (1974) and “‘monument’ for V. Tatlin” (1967) are examples of two of the artist’s most renowned series, the “barriers” and the “monuments,” respectively. A leading figure of Minimal art, Flavin used mass-produced fluorescent light fixtures to make sculptural installations in which light is the primary medium. By blurring the boundary between artwork and environment, he challenged the definition of sculpture as a discrete object. While each of the “monuments” has a fixed form, the “barrier” works are what the artist called “situational,” not site-specific but responsive to the proportions of the spaces in which they are displayed. 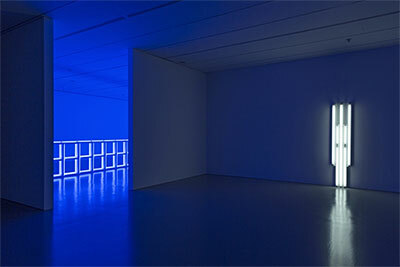 “untitled” is a freestanding work that extends diagonally for 92 feet across the gallery, prohibiting access to part of the space and filling the room with blue light. This installation of ‘untitled’ is the largest configuration of this barrier that has ever been shown. “untitled” is paired with the wall-mounted “monument,” which consists of white bulbs. “monument” is named for Russian modernist Vladimir Tatlin, whose unbuilt “Monument to the Third International” spurred the experiments of the Constructivists. First installed in 1975 at the Kunsthalle Basel, “untitled” is dedicated to Carlo Huber, who was director there, and his wife, Helga.